Good afternoon from Lake Arrowhead Lifestyle® The prime home in Lake Arrowhead would be a lake front home and breaking it down we are not doing too shabby on home sales. 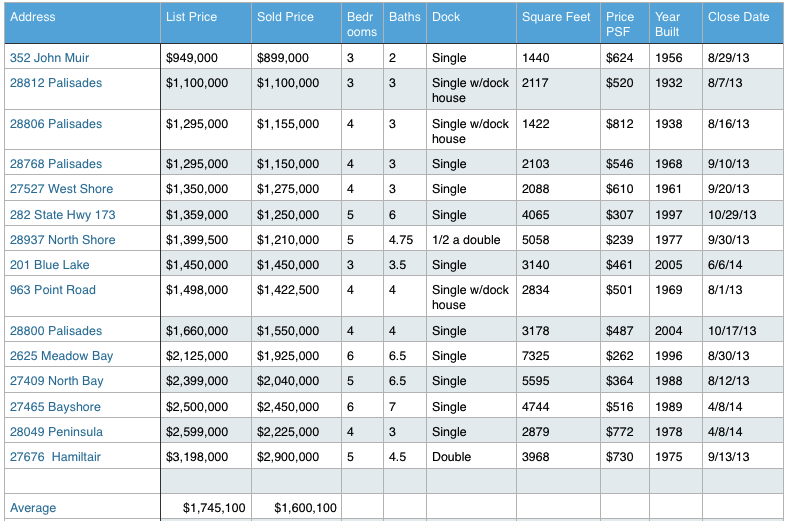 We currently have 44 lake front homes listed for sale. We have a total of 367 homes not including lake fronts for sale in Lake Arrowhead. In the last 12 months we have had 17 Lake Front Homes in Lake Arrowhead close escrow. That is a pretty good ratio. Below is the chart showing where we are and the average listing price and selling price along with square footage. All information was obtained from Rim AOR, all information is deemed reliable but not guaranteed.